Orion Code App is a old scam trading software for Forex, which was originally marketed for binary options. The way we know that you will have problems using Orion Code, is because of the many complaints from people who used it before. Do Not Deposit your money until you read how the scam works. You will lose your money at OrionCode! You Want Automated Trading Software? look here. The way the Orion Code scam works is really very simple and easy to understand if you would just take a minute and think. You probably noticed while watching the video, what it says on their website. Scam Alert! We have seen many scams advertise money back guarantees, and they are all fake. Just go try emailing the people at Orion Code and ask them how you get your money back. You will never receive an email reply from them. You can also email the spammer sending you those junk emails and ask them too, see if they call you back. The only phone call you will get is from multiple scam brokers trying to get you to invest $10,000 in their ponzi scheme. This trading software is not actually a new software, if you go look at our review of Crypto Revolt, you will see that it is the exact same product. The software has been published under 50 different aliases, and the only thing that is different is the actor in the video. If you are wondering how to login into the software, you will not find a way, because there is none. Take a look at the screenshot below of the software setting page. A serious investor will easily notice that it is a one button trading robot, with no abilities to control risk or make a profit. To see real trading robot software, look here. The Forex industry is plagued with bad brokers, and online scams. Scammers in offshore locations setup on fake brokerage firms that look real and legitimate to lure you into giving them your money. The only place to trade online, is with a local licensed and regulated broker. 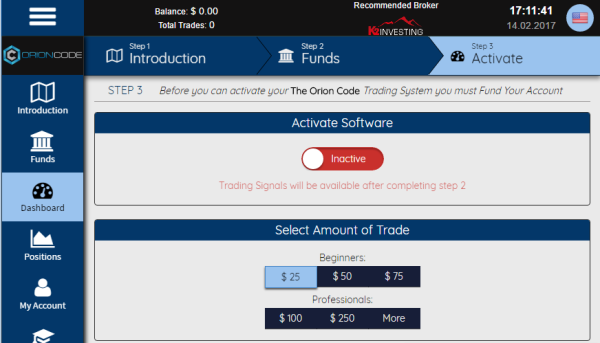 When signed up for Orion Code, they told us to trade at Konto FX, which is not a licensed broker. Look here to see the good licensed brokers. Please tell other readers which scam broker the Orion Code told you to trade with, in the comments section below.